Welcome to Paradise! 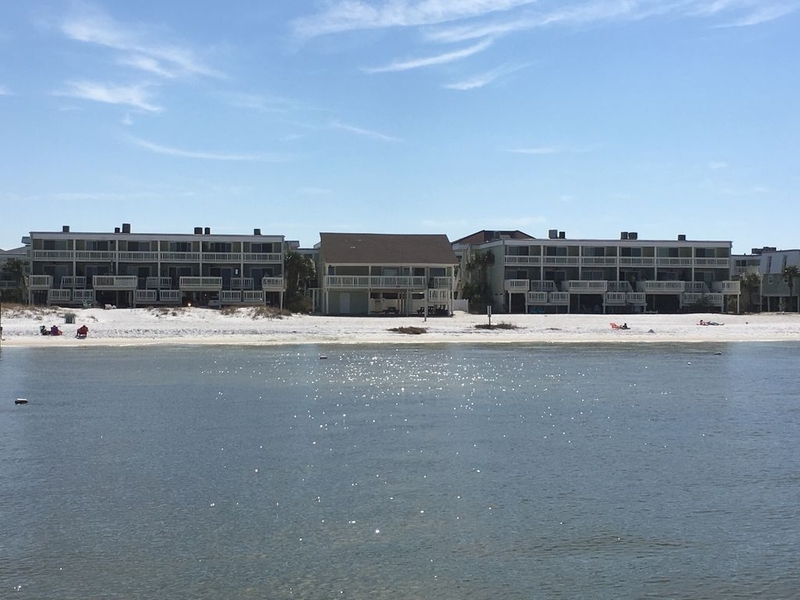 Island's End vacation rental is the best of both worlds because it is ideally located in the Pensacola Beach Boardwalk sound side community with 600 feet of one of the Island's largest and most beautiful private white sandy beaches. 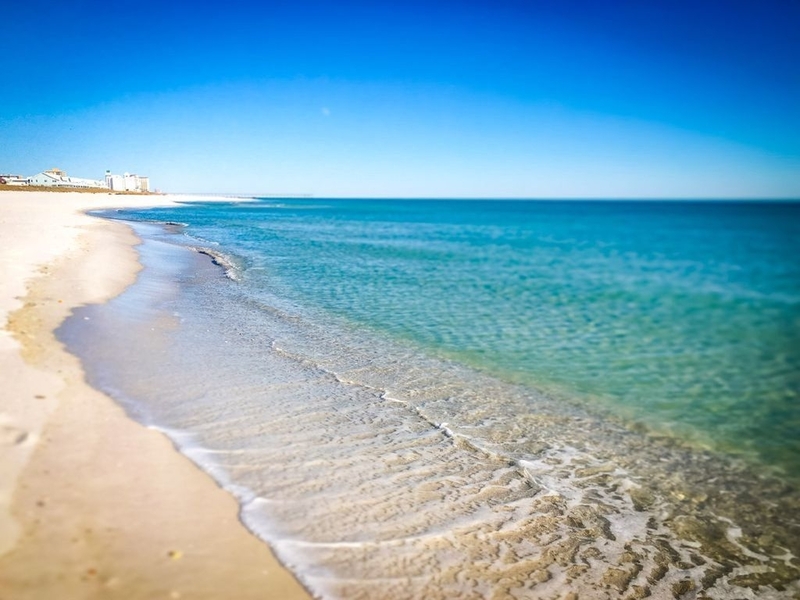 Island's End is also located just a four minute walk to Pensacola Beach access to the beautiful Gulf of Mexico. This location makes the perfect vacation destination for families because of the choice of the beautiful Caribbean Blue Gulf Side Beach or the calm Caribbean Blue Bay side. As soon as you step into the entrance of Island's End you will see it has been recently updated! The entrance provides a welcoming space to access the condo. Just up the steps from the entrance you will find the kitchen which has custom cabinetry, granite countertops, New Stainless Steel appliances, tile floor throughout the condo and fresh paint. The open kitchen/dining area features a central work island for additional work and storage space.. The kitchen island also has two counter height bar stools for guests to sit and relax while enjoying the view of the sound through the large patio door. The kitchen table seats an additional four guests comfortably. There is a booster seat available for toddlers.The kitchen is fully equipped with everything you need to cook a wonderful meal. There is a pantry cabinet to store the groceries/supplies you bring. A new 40 gallon water heater will help to ensure hot water in kitchen and bathrooms. Just through the kitchen/dining room patio door is a large balcony that wraps around to the living area and features additional outside dining. Just after purchasing the condo in May 2018, we updated the living area with two full size new leather couches.. We added an additional pretty blue couch for extra seating and a pop of color. A natural fiber rug in blue, beige and brown, updated end tables and a beautiful coffee table add to the decor. New lamps, curtains, art and accessories make the living area beautiful as well as functional. TV ( Cable TV and WiFi included), and DVD player with a small selection of DVDs, books and board games are stored in the TV console.. There is a full size washer and dryer located just off the kitchen in a laundry closet. Several beach towels are located above the washer/dryer for guests to use as well as a small drink cooler. Moving up to the third floor, you find two large bedrooms with attached bathrooms. The Master bedroom has a king sized bed with comfortable mattress, two night stands, dresser and TV. We added blackout patio and window curtains to help you enjoy a full night of restful sleep. New bedding and wall art give the room the look of the coast.There is a new TV to enjoy before dozing off to sleep. The second bedroom has one bunkbed (two twin beds) and one queen bed. New mattresses and bedding makes this room extra comfortable and perfect as the children's room or provides the perfect combination for a couple with children. This room also has a wall mounted TV. Both bathrooms have maple cabinets. . Just in case you are traveling with a baby or toddler, we include a pack n play. Each bedroom opens up to wonderful outside living with the wrap around balcony. One of the very best features of this condo is the outside spaces. As you drive up to the condo, you will find covered parking for two cars with overflow parking in designated areas. 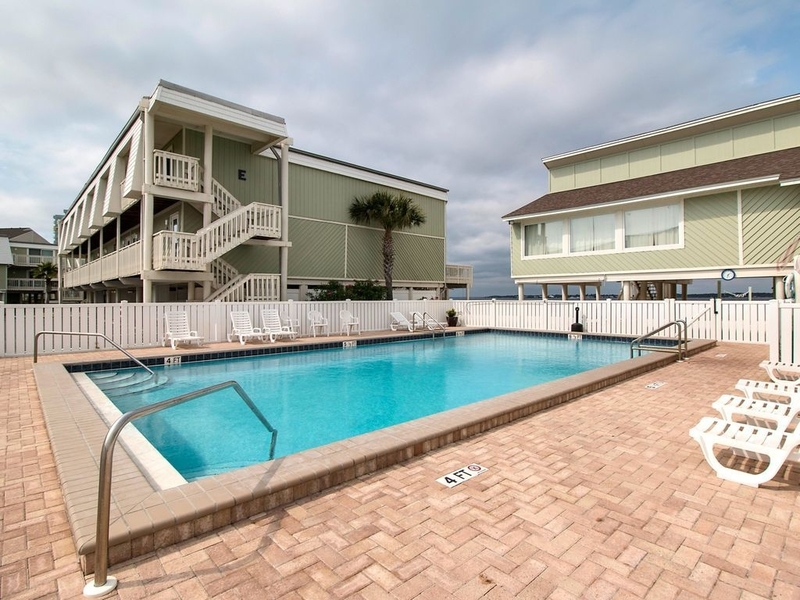 ( Several parking spaces are located just behind the condo) There is a private outside storage area that has pool/beach toys, beach umbrella, and beach chairs to make your vacation more enjoyable. 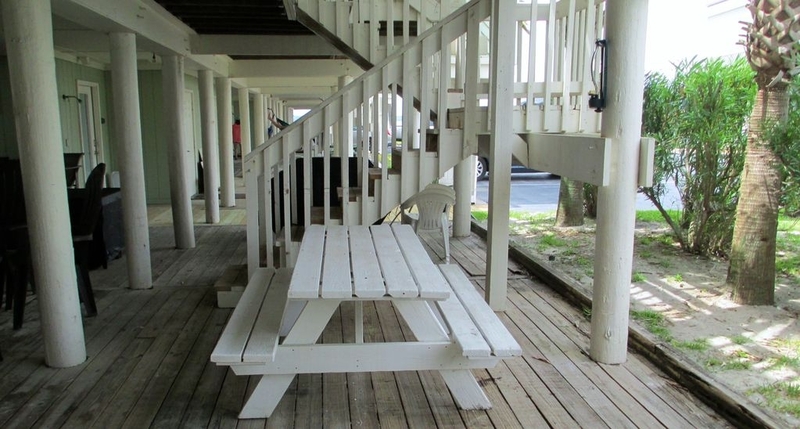 Under the condo, you will find rocking chairs, a picnic table, porch swing, and a CHARCOAL GRILL. (GRILL CANNOT BE USED UNDER THE CONDO). IT HAS TO BE MOVED AWAY FROM ANY WOODEN STRUCTURE INCLUDING THE BUILDING AND STAIRS . There is also an outside shower, towel rack and wet shoe box. Please be sure to wash off bare feet and remove shoes before entering. The asphalt will stain the bottom of bare feet and track into the condo. The ground floor area has steps that lead to the upper two balconies with condo entrances through the patio doors. The amenities just don't stop! The private beach is perfect for just relaxing in the sun or being more adventuresome with your paddle boards, kayaks, fishing gear or snorkeling gear. The private beach is equipped with a volleyball net and a new pier. In case you want an additional way to enjoy the water, there is a beautiful pool and clubhouse. 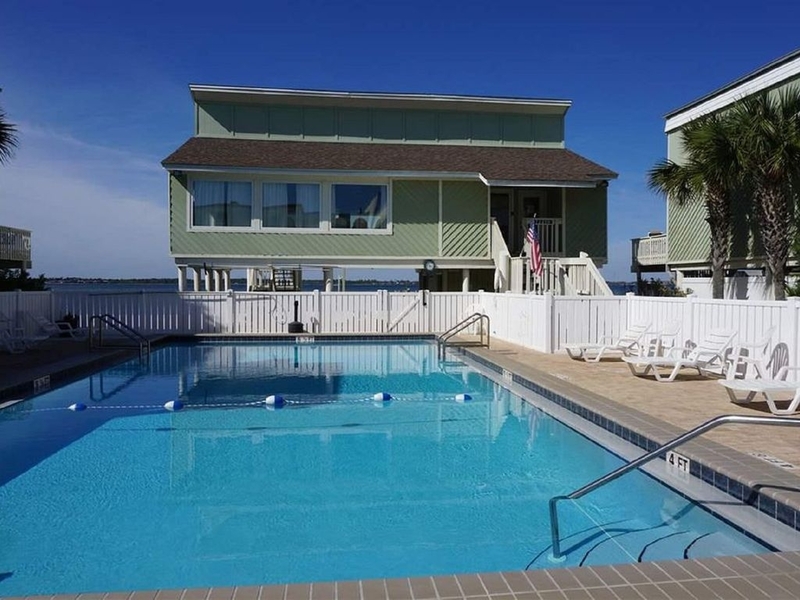 Vacation in this quiet beach community with all the amenities for the perfect vacation. AND the condo is located less than five miles from the hub of Pensacola Beach with restaurants, shops and special events. If you don't want to drive you can take the BEACH TROLLY which stops just down from the complex and runs during peak beach vacation times. 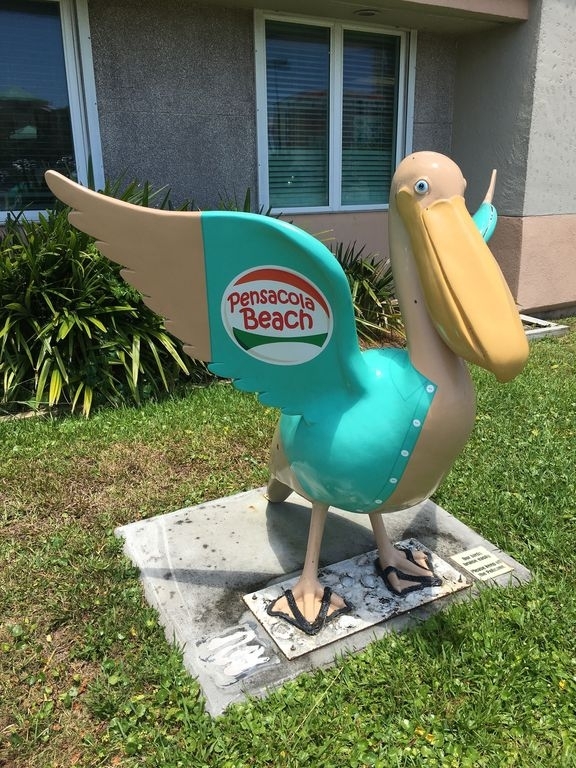 This condo is located just minutes from historic Fort Pickens National Park and National Sea Shore and walking distance to one of the best restaurants in the area, Peg Leg Pete's! Other area attractions include, parasailing, dolphin cruises, putt putt golf, BANDS ON THE BEACH, go carts rental, jet skis rentals, fishing charters, bike rentals and shopping. Within a short drive you can visit a great zoo, beautiful golf courses and museums including the National Naval Aviation Museum/ Fort Barrancas and Lighthouse, Historic Pensacola Village, Pensacola Mess Hall for kids who love science, the Ft.Walton Gulfarium and Ft. Walton Water Park. So pack your clothes and sunscreen and head to Island's End for the best beach vacation ever! Make some memories. We absolutely love the Boardwalk community. It is low density with just 84 condos and one of them is owned and used by the HOA. 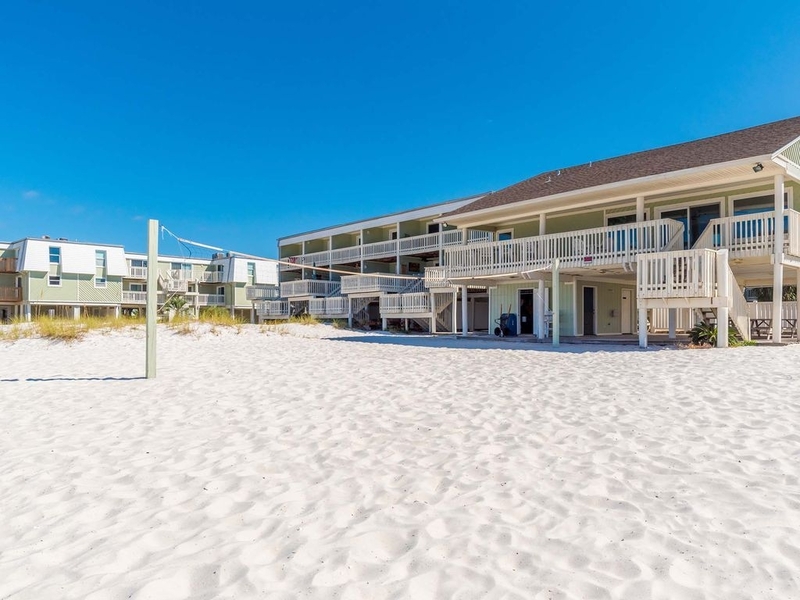 The location is so convenient to local attractions and restaurants.The condo owns 600 feet of white sandy beaches and is located directly across from the boardwalk to the Gulf Of Mexico on Pensacola Beach. There is a trolley pick up/drop off located just a short distance from the complex. Boardwalk is very close to the hub of Pensacola Beach but just far enough away that we find it quiet and relaxing. Actually it is located closer to the Island's End with two lane roads in front so traffic is less congested and walking or jogging on the sidewalks along Ft. Pickens Road is relaxing. We feel the pace here is a little slower and life is quieter. 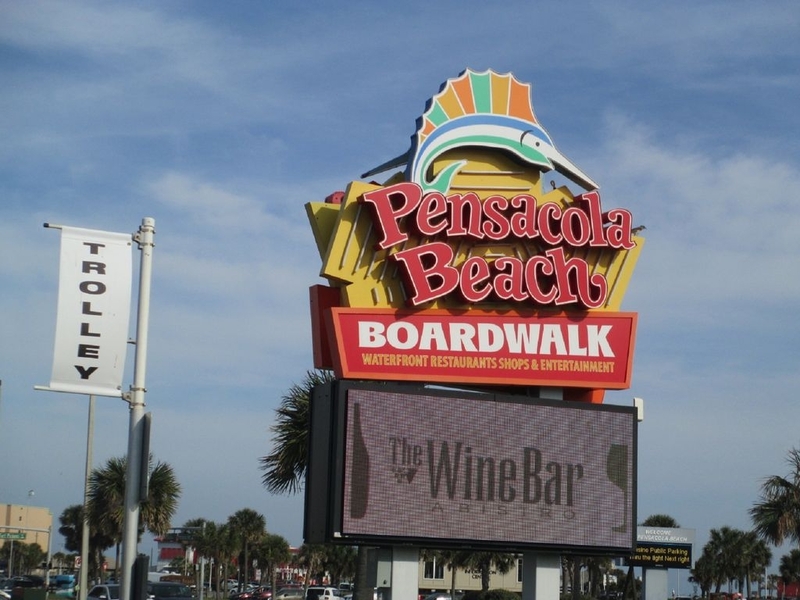 The biggest draw about the Boardwalk Complex was the 600 feet of sandy white beach located on Pensacola Bay. The condo is just steps away from this area. I have two young grandchildren and we enjoy the beauty and calm of the Bay where we can relax knowing with adult supervision the children can enjoy the water in safety; especially when the red flags are flying for the Gulf Waters. Yet, with the the boardwalk to the Gulf just across the street we easily make the walk to pick up shells, ghost crab at night, enjoy the waves and all the Gulf Side has to offer. If the children want a different water experience they can enjoy the pool which is located a two minute walk from the condo and can be viewed from the living area and the second bedroom. This complex is unique in the amount of outdoor living spaces it has. Underneath the unit is enough space to accommodate two cars. No parking passes needed!!! Overflow parking is available in designated areas. There is space for a picnic table, a grill, and a lounging area all situated underneath the condo where it is shaded and the Gulf Breeze blows to keep you cool. The unit also has its own private outdoor shower. Wonderful to wash off the sand before entering the condo. In addition to the lower outside area, there are two large balconies that are accessible from outside stairs or the from the living areas of the condo. On the first balcony, we include a table and chairs for dining or relaxing. Imagine watching the white sands of the Bay and emerald green water while enjoying your dinner or a drink. We also like having our own washer and dryer to keep up with the loads of vacation laundry. You never have to take lots of dirty laundry home. We also like that there are two full and one half baths. Never waiting to get into a bathroom. As owners we are aware that hot water can be a premium when it is time for showers. We installed a new 40 gallon hot water heater when we purchased the condo. Must be at least 25 to rent. ID required. No more than 6 guests with one baby under two. All guests will sign a rental agreement and a Boardwalk Rules and Regs checklist. All guests will abide by the rules and regs given on reservation of condo. Check in at 3PM and checkout is at 10AM. Fifty percent of rental fee, cleaning fee, taxes and full deposit required on booking. Balance due 60 days prior to scheduled check in. A. Cancellation more than 60 days prior to scheduled arrival will get a full refund of all charges except the deposits, which is non refundable. B. Cancellations received 30 days prior to scheduled arrival will be refunded 1/2 of the rental amount and the cleaning fee. C. No refunds will be given in the event of bad weather UNLESS Pensacola Beach is ordered evacuated or the condo becomes uninhabitable. This condo is a town home with a private entrance on ground level. Stairs lead to main living area that includes kitchen, living room, 1/2 bath and laundry. A large balcony is accessible through two sliding glass doors or by stairs leading from ground floor. Additional inside stairs lead to the top floor which has two bedrooms. Each bedroom has a private bath. Sliding doors in each bedroom lead to top balcony which can also be accessible by outdoor stairs. Our family has always loved saltwater and all that goes with beach side living. When our children were young, we purchased beach property in NC near our home and enjoyed beach life with family and friends. A move to Florida in 1994 made owning the NC beach property unrealistic. 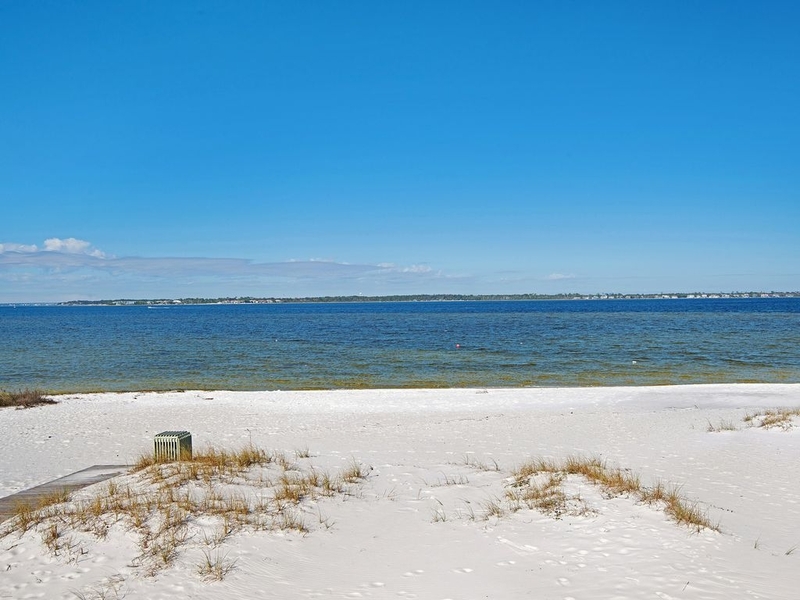 Reluctantly, we sold our NC beach property and moved to a home on Pensacola Bay. For several years we loved living where we could look out on the bay from every room in our home, but we eventually moved inland to a community in Pace, Florida. We still felt drawn to the salt water that even enjoying our boat could not satisfy. So in 2009 we purchased a dream condo in Gulf Shores, Alabama. We began enjoying the Salt Life with a condo on the Gulf of Mexico along with becoming VACATION RENTAL owners. Recently we began to feel a pull to find property closer to our home in the Pensacola area. After looking for over a year, we found our new dream vacation home in the Board Walk community of Pensacola Beach. The perfect place to continue to make Salt Life memories. The perfect place for you to make family memories too! My husband and I enjoy everything about beach life. We truly love living where others vacation. We hope our dream beach home becomes the vacation spot you dream about. Our family lives locally and includes our daughter, her husband, and two children, our son and his wife. 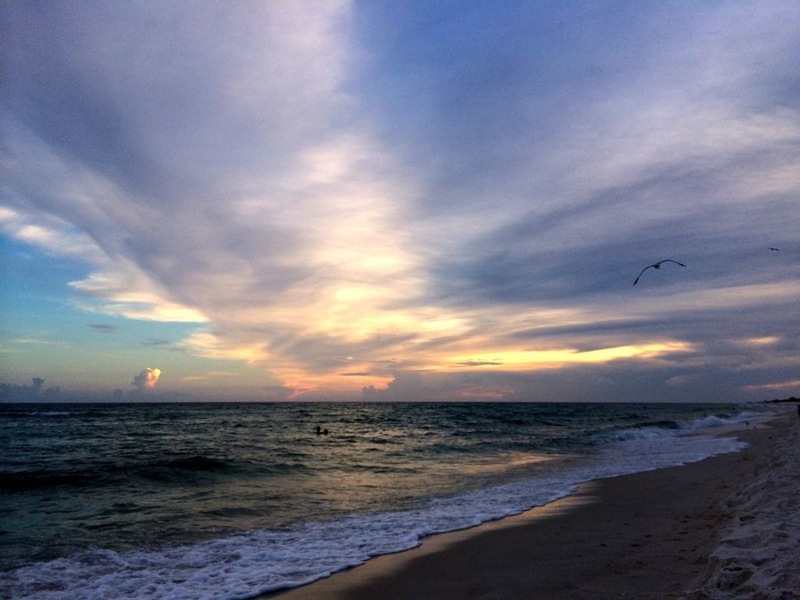 They all enjoy the beach life too and we are excited about Island's End and adding to the beach memories we can make right on Pensacola Beach. We loved our stay in this very nice condo. Great location just steps from the bay. This condo was a great place to stay and perfect for our weekend in Pensacola Beach. Everything in the unit was very nice and of great quality. It’s very spacious and is located steps from the bay and a short walk to the gulf. The walkway from the bay beach out to the bay is a wonderful place to enjoy sunrises and sunsets. The kitchen was very well equipped. My family was very pleased with the big screen TV and comfortable living room. We especially liked the outdoor staircases and balcony space. We would definitely stay here again. The condo is in a great location. Close to the action but far enough away to have some quiet too!. The owner was swift to handle any questions/concerns we might have had. Also the owner was very generous with the amenities she left to get us started. Wonderful Condo in a perfect location! We had an amazing vacation staying at this location! The condo has everything you will need and is updated beautifully. Sheri and Joe are wonderful hosts and will respond quickly to any questions you have. The condo is just steps from the sound side beach which is calm and serene. We lounged, snorkled, played volleyball and kayaked here and fished off of the pier. In 5 minutes walk, you can be on the gulf side with higher waves and bluer water. You're very close to Fort Pickens which we purchased a week long pass and utilized the beaches there for fishing, birding and swimming and touring the fort, learning the history of Pensacola. 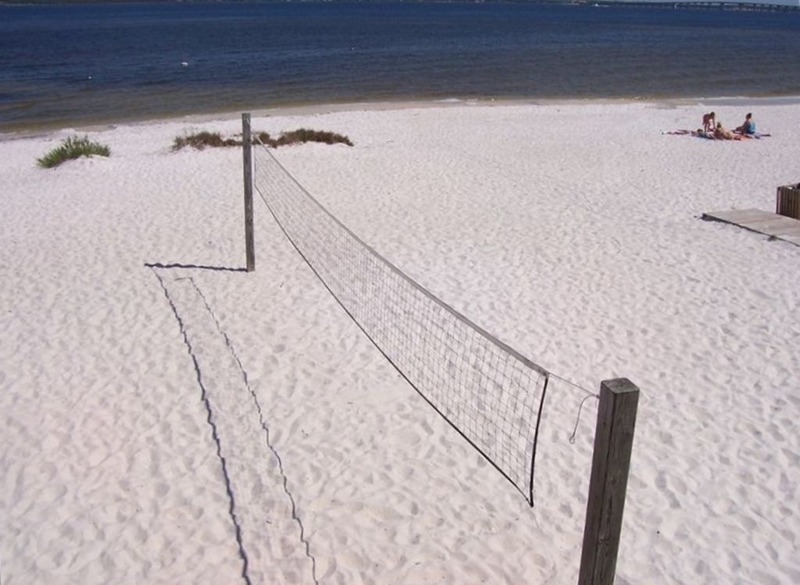 We found public tennis courts and the Pensacola boardwalk is just a few minutes drive. We parasailed, took a 3 hour jetski dolphin adventure, went deep sea fishing, drove to Navarre, tried out several of the beaches along the way to Navarre and found a good snorkeling reef. 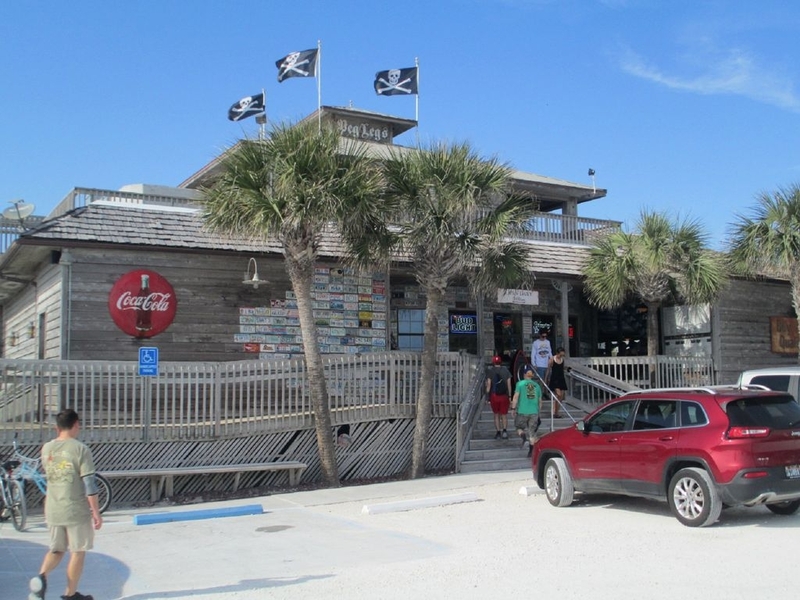 We tried out Shaggy's, Founders and Peg Leg Pete's as dinner spots. Shaggy's was the favorite of the 3. There's a Tom Thumb convenience store a minute's drive for frozen bait, ice, beverages, etc. or you can drive about 10 minutes to a Publix or Walmart. We also went to the National Aviation Museum which is free and very interesting. As we drove away after 8 days, the kids said, "there goes paradise." Absolutely Wonderful Place to Stay! Perfect Location! 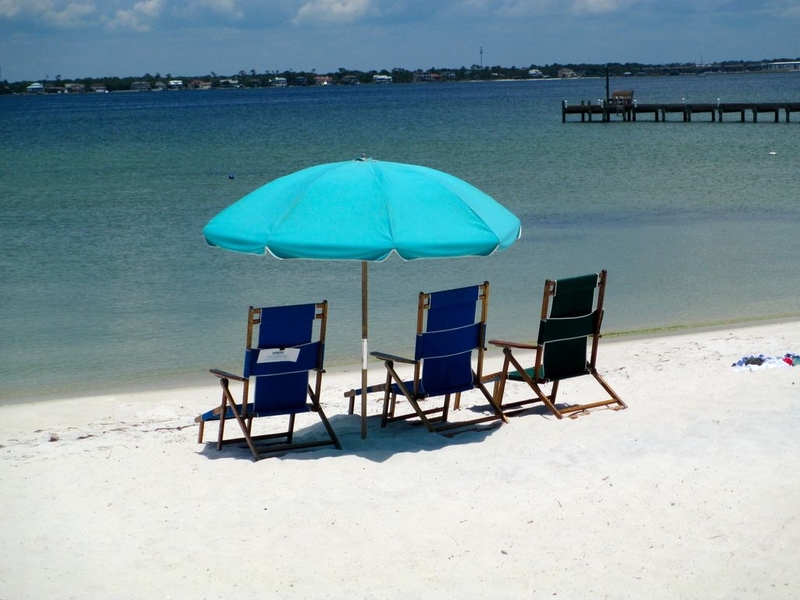 Absolutely wonderful place for a family of four to stay and enjoy Pensacola Beach. Located on the Bay side, but a very short walk across the street to the beach. Perfect for paddle boarding and kayaking. Townhouse is clean!! Well-stocked kitchen!! Plenty of towels / linens!! Loved the balconies on both floors and especially loved relaxing on the rocking chairs beneath the carport. Would recommend for sure and will hopefully be back next year!! Thank you Sheri!!! We had a wonderful time! 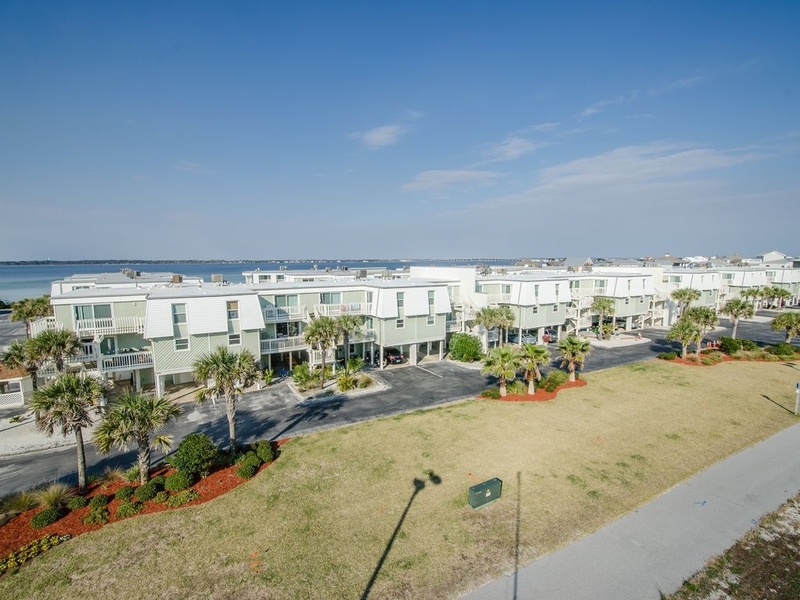 Perfect weather, blue angels and this condo is convenient to everything on the beach! We are hoping to book another trip this year and we will be back next July!!! Great relaxing week with the family. The complex is great for young kids! The condo we stayed F8 was very very nice. Comfortable,beautifully furnished and stocked with everything you could possibly need. Great communication as well. Fantastic condo, indoor & out! Also great location!! The owners wanted to ensure that your stay at their condo was a great experience! Not only is it a lovely condo, but they thought of everything in having the unit prepared for guest. We will be staying there again!! Will definitely be coming back! Our family absolutely loved our stay! Perfect location! Easy, Short walk to the beach or pool. Bay Area was perfect for our 2 littles to play and splash. Quiet and peaceful! !